Arenal Volcano with an altitude of 1633 meters. The Arenal Volcano is one of the attractions of Costa Rica, many postcards and guide books display this unique volcano. It is assumed that the volcano was most active between 1200 and 1500. For the pre-Columbian Indians the Arenal was a holy mountain. During the colonial time, when Spanish settlers arrived, the volcano was quiet and covered by forest. But hot springs indicated the existence of a volcano in the area. On the 29th of July in 1968 there was huge volcanic eruption. The west side of the Arenal Volcano burst. 78 people died and the villages Tabacon, Pueblo Nuevo were buried below ash, lava and dust. Since then the volcano has been active. At the entrance of the national park there are maps and information panels for the visitors. Usually on a day it was possible to observe several small eruptions, accompanied by smoking hot lava that flowed down the slopes of the volcano. Small stones were expulsed out of the crater and rolled down the flanks. During the night this looked even more spectacular when the lava had a glowing red color. During an eruption the top looked like a firework. Unfortunately the volcano is quiet at the moment and there is no lava flow. Unfortunately the top is often covered with clouds, a condition that can last for several days. 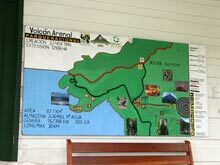 But there a other attractions in the Arenal area to enjoy till the sky clears up again. There are several hot springs close to the volcano. Hiking trails lead to sites of former eruptions. Some of the rocks that were thrown out of the crater have the size of a house! 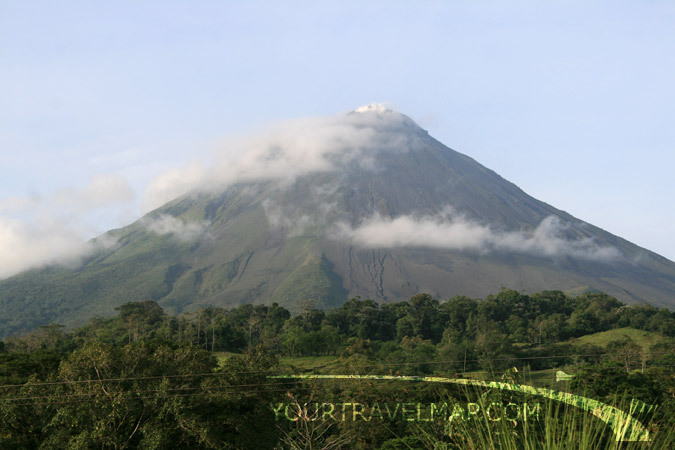 The Arenal volcano is one of the most active volcanoes on earth. Arenal Volcano is 1633 meters high. Chato Volcano is 1140 meters high. Business hours: The park is open every day from 8:30 am to 4:00 pm. The park is open every day of the year, open during holidays as well. 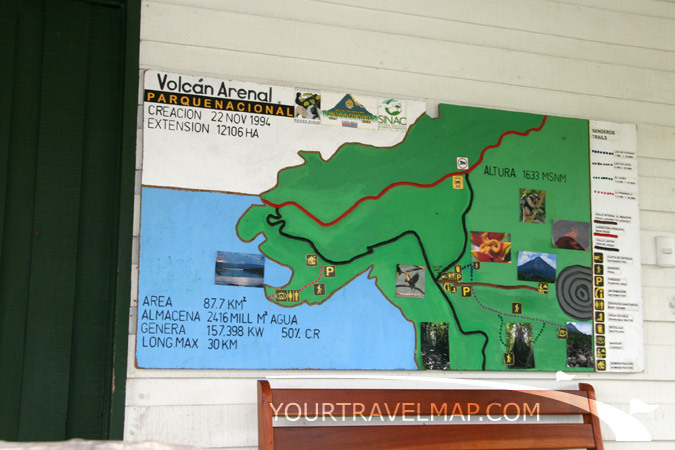 Arenal Volcano National Park telephone: (506) 2200 4192. 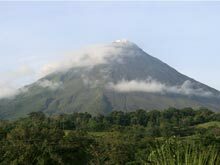 Another volcano that is located inside the boundaries of the Arenal Volcano National Park is the Volcano Chato. The national park measures 12026 hectares. The Lake Arenal is well known amongst wind surfers and kite surfers. The lake expands over 124 square kilometers. In 1973 a dam was built and the lake was created to generate electricity with water energy. Locals and tourists enjoy fishing on the lake.